The theory of Reed-Bed sewage treatment is simple, though in practise, the treatment is often far from satisfactory due to incorrect design by cheap, 'Cowboy' designers and infrequent maintenance of the system. WTE Ltd. can design and install reed bed systems throughout the UK. We have stopped our reed bed design work due to the very cold weather during recent winters and because one of our clients nearly died because of an infection caught whilst maintaining the bed. Many systems in the North East froze solid for weeks and the resulting pollution and problems, due to the complete lack of sanitation for the owners, has made us re-evaluate their suitability for the current Northern UK climate. Our client had a pub/restaurant and contracted an infection from the sewage effluent via a reed- cut on his arm. He collapsed 2 hours later and was rushed to Intensive Care. The Specialist told him that if he had been delayed by only another 1/2 hour, he would have needed his arm amputating. This is too much risk for us to design any more reedbeds. If you are determined to have a reed bed, then we suggest that you contact Oceans ESU who are, in our opinion, a reputable and professional reed bed system design company. You can also contact The Constructed Wetlands Association for details of their other members. The Common Reed ( Phragmites Australis.) has the ability to transfer oxygen from its leaves, down through its stem and out via its root system in the gravel bed. This encourages micro-organisms that digest the pollutants in sewage to colonise the area. The sewage effluent flows through this zone and is treated by the micro-organisms. Early Reed Bed Sewage Treatment systems used the horizontal flow type of reed bed, where the liquid flows horizontally through the bed, though these had a lot of problems and have largely been replaced by other types. There are three different types of systems that have been developed during the past 25 years for treating wastewater and sewage effluent. Horizontal Flow systems only work when the effluent is of low strength. They are not to be used to treat septic tank effluent, as this is too strong. They are also of no real use for reducing ammonia levels, but they can reduce the level of BOD (Biochemical Oxygen Demand) and SS (Suspended Solids) in sewage treatment plant effluent. 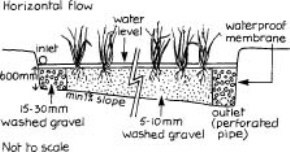 Horizontal flow reed-beds should only be considered for tertiary treatment after a full sewage treatment plant. A typical application would be to treat the discharge from a slightly undersized package sewage treatment plant which is failing to meet its discharge permit standard for BOD and Suspended Solids. Vertical flow systems are more efficient than horizontal flow reed-beds and can handle stronger strength effluent. They can reduce ammonia as well as BOD and SS levels. It is usual for there to be two reed-beds installed, one after the other down the slope of the site. Vertical flow ones can be used to treat septic tank effluent. Typically these systems are used for secondary treatment of sewage after a septic tank or settlement tank, or tertiary treatment of sewage treatment plant effluent, but usually involve the use of electric pumps unless the site has reasonable gradient. Multi-stage reed-bed systems, incorporating two stages of vertical flow. They work on a 'fill and drain' system, where one bed fills over 12 hours whilst the other one drains and vice versa. The idea is that as the effluent drains out of the gravel, air is pulled in and helps to form an aerobic bacterial colony on the gravel surface to digest the pollutants. These systems invariably require the use of electric pumps, timers and control panels as the effluent is switched from one bed to the other every 12 hours. Down-flow reed-beds are normally used for treating septic tank effluent. Unless the site has a decent gradient, it is not usually possible to avoid the need for electrical power when designing a reed bed system. Even simple horizontal flow designs usually need control systems in order to ensure that surge flows don't swamp the system. In the case of Vertical flow and down-flow reed beds, a suitable electrical pumping system is required. Reed beds are not a long term solution. They are a relatively new idea and even when they are designed and maintained properly, they will only be viable for up to a maximum of 7 to 10 years for reed beds that follow a full treatment plant as a final polishing filter only. Severn Trent Water, with over 300 installed, is currently having to start a refurbishment programme for reed beds which have been in use for a few years. 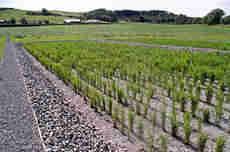 According to Paul Griffin at Aston University, the refurbishment, which includes the removal and replacement of not only the reeds, but the entire gravel bed, is required every 7 to 10 years. He should know as Severn Trent funded research at Aston University into trying to find out why the reed beds clog. Reed beds that follow septic tanks have even more solids to deal with. It is not a cheap operation to completely replace a bed and what do you do for sewage treatment whilst the refurbishment is taking place? Reed bed systems are not low maintenance and a regular maintenance programme is required to keep them working properly. The reed beds that work are usually those whose owners love gardening, do not have a big enough garden to keep themselves occupied and are not worried by coming into contact with faecal bacteria, spiders, Grass Snakes (they love reedbeds), mice, rats and their associated diseases. The 'gardeners' will also require several injections every year against leptospirosis, Hepatitis, etc. so fear of needles is also a nuisance. Mosquitos and flies are a real problem during the summer months, as they breed in the reedbeds. Make sure that the reedbed is situated well away from dwellings or recreational areas as their habitat has been contaminated with human sewage. The flow through the bed is even and regulated using balancing tanks and pumps if necessary. Reed growth is always vigorous, even, and that any gaps are quickly re-planted. Dead reeds should be harvested and composted every October to prevent them from rotting onto the surface of the bed and clogging it. It also promotes healthy new reed growth in the Spring. Any preferential pathways created by the flow of effluent are disrupted by digging up the bed and an even flow is re-established over the entire area. During very cold weather, such as that experienced in the winters of 2010/2011, reed beds can freeze solid and alternative arrangements must be made for foul drainage and sanitation. This is a new situation in the UK as we have not experienced this type of arctic weather since reed beds were invented. The 'Gardener' of the bed invariably comes into contact with some very nasty bacteria and viruses, so it is vital that vaccinations against Diphtheria, Typhoid, Tetanus, Polio, Leptospirosis and Hepatitis are kept rigorously up to date. Even then, there is no immunity to most infections. The reed bed area is fenced to prevent children and animals coming into contact with the sewage water. Any fencing issues must be rectified as soon as possible. Weedkiller spray must never be allowed to drift onto the bed. Any clogged areas of gravel must be removed, new gravel installed and the section re-planted. Reed beds tend to attract rodents, particularly in the winter, so unless you like rats and mice, you may want to consider some kind of pest control system. Grass Snakes tend to be abundant in reedbeds, making their nests, laying their eggs and hibernating in the dense bottom vegetation. They are completely harmless however. The septic tank must be emptied on a regular basis - at least annually. Most of the clogging problems occur at the inlet and outlet end of the bed. If the blockage is at the inlet end, then the septic tank or sewage plant can 'back-up' and prevent use of the foul drainage system. If it is at the outlet end, then the reed-bed will flood and can overflow. Reed-beds are not a cheap or easy option for sewage treatment. A typical price for a single house installation is between £3000 and £7000 and this does NOT include the septic tank, humus tank, pumping stations, balancing tanks or drainfield installation cost. The septic tank installation is typically around £3000. Humus and balancing tanks are around £1500 installed. Pumping stations are around £1500 to £2000 installed. You are still left with the problem of where to discharge the cleaned water. This is preferably to a watercourse, but if there is not one available, then a soakaway drainfield is the only option. Expect to pay another £2000 to £4000 for this. A complete sewage treatment plant system costs in the region of £2000 to £3000 and installation is typically around £2000 to £4000, depending on the site conditions. Maintenance is usually only annual and carried out by someone else. Typical maintenance costs are £100/service.